Robotic-assisted orthopaedic surgery is an exciting new development for patients requiring partial knee placement. Robotic surgery technology for use in partial knee replacements was introduced in Australia in 2015, with Canberra getting on board in 2017. The MAKO robotic system is a carefully controlled robotic arm that doesn’t take over but rather aids the surgeons in the placement of the prosthetic components in a partial knee replacement, making the operation more accurate and safe. The main difference with this type of surgery from a patient’s point of view is that a pre-operative CT scan is needed to plan the procedure, whereas traditionally, the surgeon relied purely on an x-ray to plan a partial knee replacement. When performing robotic partial knee replacement surgery, planning for the procedure is done by a specialist team working in collaboration with the surgeon to determine the optimal position for the components. Robotic-assisted surgery is a big step forward in patient care in orthopaedic surgery, due to its ability to perform surgery more tailored to the individual patient, allowing the surgeon to preserve healthy bone and soft tissue and take away only the diseased portions. Once the surgery begins, the surgeon exposes the knee joint in the standard way. Trackers are placed on the femur and tibia, allowing the robot to register the bones. Once the robot understands the geometry, it creates a three-dimensional plan that matches the CT scan. The robotic arm has a burr attached to perform precision cuts for the partial knee replacement. Although the robot is constraining the surgeon to execute the plan, the surgeon remains in control of the surgery at all times and continues to carry all responsibility for the success of the operation. 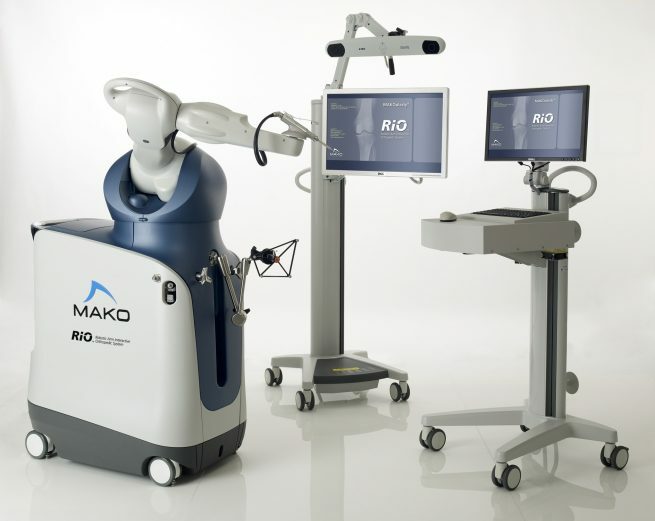 Rather than taking over, the MAKO robotic system ensures that the surgeon operates only within the area defined before the surgery, and helps prevent the surgeon moving outside those boundaries, helping to ensure accurate placement and alignment of the prosthesis. Post-operative, the recovery process is the same as with a traditional partial knee replacement, with exercise and physical therapy required to get the patient back to their regular activities. If you have any questions or concerns, r want to find out if partial knee replacement surgery is an option for you, contact us to book an appointment with our highly experienced orthopaedic surgeons in Canberra.